Some changes have occurred in the world of online maps since I last wrote about what’s available. Ask.com used to be the only mapping service with an option for walking directions. They eliminated that when they migrated their map to use Microsoft’s Virtual Earth, which provides only driving directions. While Ask.com removed the walking feature, Google enabled walking directions, which ignores the direction of one way streets. While Google Maps doesn’t currently know about bike paths or pedestrian bridges, I’m excited to see this tidbit from the Google developers: “We’re working on collecting new data on pedestrian pathways….” Could a “bike there” option be far away. The only nod to bike-friendliness from Mapquest comes in the form of an “Avoid Highways” feature. A MapQuest developer I know who’s an avid cyclist has lobbied her company for years to provide bike friendly features to their product, to no avail. While Yahoo Maps doesn’t currently offer an “avoid highways” option, I’m told this is in the works. But check out what Yahoo! 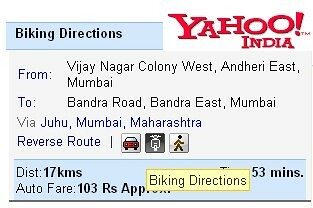 India maps offers to users — a “Biking Directions” button! Is that a bike or a scooter indicating scooter friendly (mostly prob means avoid highways)? Scooter makes more sense for India with all the auto-rickshaws and the like. In mapping a couple of routes around home, I also noticed Google Maps rerouted around an unbelievably steep hill when I switched from driving to walking. Perhaps they’re using some of the terrain data layer? Any of them that let you plot your course and print it out? Any discussion of bicycle online maps should include bike specific tools such as Bikely (bikeradar) and MapMyRide and many more. I don’t see any features that explicitly acknowledge the existence of bike trails, but the addition of “Follow the road” technology makes using them much more convenient, though you’ll still have to study the satellite photos to spot actual trails. It’s probably worth mentioning that Google Maps also has an “Avoid highways” button. I used Google Maps “avoid highways” feature to route my current commute. Although it’s accurate it takes me through steep hilly areas that are hard to avoid. The best way is to map several different routes and drive them or try biking on a free weekend. I don’t know if the other mapping services have this feature or not, but a feature I love on Google Maps is the ability to drag your route around. With “Avoid highways” checked, I drag my route over to roads that I know are better for cycling and let Google adjust the remaining portions for sections I’m not sure about. Click on options at the bottom of the page and you can toggle the “bike” option. It would seem that the six billon dollars spent on bicycles in the U.S. would show that the potintial for profits in city maps would be clear. But then again, I bet the auto indistry spends more to surpress bicycles. Here’s a site that finds bike routes by mashing together Google Maps and a database of local designated bike routes. It also allows you to select a route based on maximum slope, pollution, green space, and a few others. It’s only for Vancouver, BC, though. Bicycling Magazine would go out of business if all the car advertisements vanished. What sort of suppression did you have in mind? OpenStreetMap is a free editable map of the whole world. It is made by people like you and me. If you know of a bike path in your area, you can draw it on the map and submit your changes. The project is still young, so there aren’t many cities fully mapped, but it’s getting there. I think it has a bright future, especially with requirements not currently met by the existing commercial map routing offers. It shows the bike paths and then has a plot of elevation climb. I would still like to go to a map and select key points so I can use my own “safer” route.